Crest Precast hosted it's 3rd annual plant tour for La Crosse, Wisc. 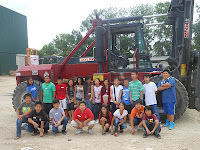 public education 6th grade ESL students. A class was presented on aggregates, cement, chemical reaction and the use of precast concrete in construction. The summer program included instruction on levers and pulleys so students were interested in over head cranes and rebar benders. At the end each student cast a precast decorated paver and Crest delivered the cured paver to the school.